NYC's Grand Central Oyster Bar Leads Me to an Old Flame! You may be surprised because you don't know the dish, an old, old New Orleans classic. Or, if you know the dish, you may still be surprised...because it involves cooked oysters, something that I don't usually fancy. When it comes to les huitres, I'm a RAW man! In fact, when it came to the oysters from the Gulf that are served in New Orleans, I was long a disdainer. Gulf oysters are usually a little bigger, softer, fatter than oysters from colder waters...and, when the offer was raw Gulf oysters, I declined. However, it didn't take me long to discover that these N'Awlins bivalve fatties are perfect for cooking! 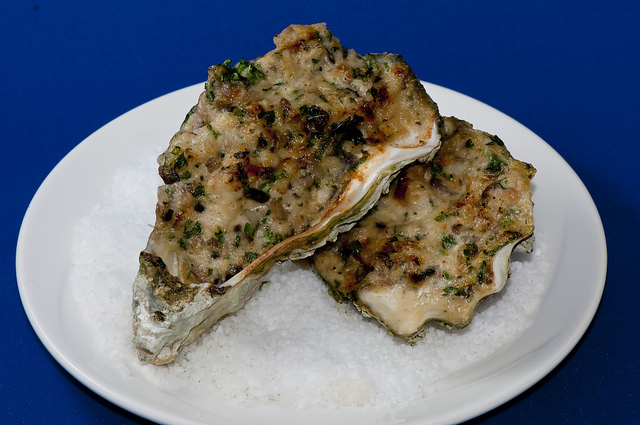 There is a reason that you can find so many cooked oyster dishes in New Orleans...fried oysters, oyster po' boys, chargrilled oysters, all the stuffed oyster dishes like Oysters Rockefeller. Some years ago I took a fancy to another New Orleans stuffed oyster dish (this one "Creole" and named after the founder of New Orleans, Jean-Baptiste Le Moyne, Sieur de Bienville). It involves shucking a fat oyster; leaving it on the half shell; preparing a béchamel flavored with green pepper, pimientos, scallions, garlic and cheese (among other things); topping the oyster with this thick-sauce preparation; and passing it all under the broiler until it's bubbly brown. The recipe is in my cookbook, It's All American Food...but, frankly, I had forgotten about it for at least a decade. Then, a few weeks ago, I was asked by the Grand Central Oyster Bar, in NYC, to do a demo on Saturday, Sept. 26, at their annual Oyster Frenzy...involving shucking contests, slurping contests, and chef demos. Now, the Grand Central Oyster Bar is the place in Manhattan, of all places in Manhattan, where I go for RAW oysters; there is a staggering menu of them every day (20 different oyster choices is not unusual!) But when asked to participate, I started thinking deviant thoughts. 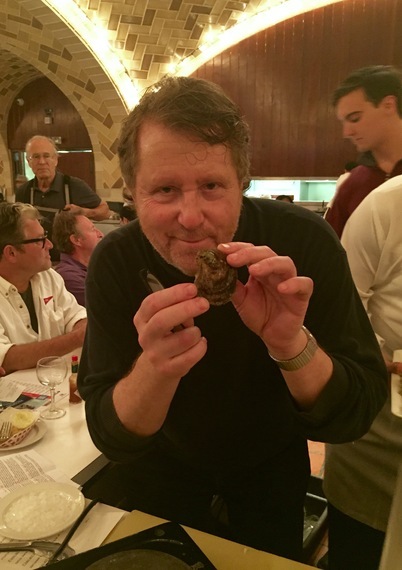 Will the crowd, after all that slurping, be ready for more raw oysters? Probably; that's how raw oyster lovers are, insatiable. But perhaps, I thought, I should top off the thrilling event with something warm...like Oysters Bienville...here in the Temple of Raw? And so I did. And it was loved. And I fell in love with this old dish all over again...vowing to make it the first course of my next dinner party in October. Oh yeah...I'll serve some raw oysters first, maybe from Watch Hill in Rhode Island, who had some of the briniest raw oysters at Saturday's event. But when that round is over...fire up the broiler! Laissez les bons temps rouler! 1. Make the béchamel sauce base: In a small saucepan, warm the milk over medium heat and bring almost to a boil, watching it carefully so that it doesn't boil over. Remove from the heat and reserve. Meanwhile, place another small saucepan over medium heat and add 2 tablespoons of the butter. When it has melted and the foam begins to subside, sprinkle in the flour, stir the mixture to blend, and immediately turn the heat down to medium-low. Continue stirring while the mixture bubbles for two minutes. Gradually whisk in the reserved warm milk, raise the heat to medium-high and bring to a boil, whisking continuously. Reduce to a bare simmer and add the nutmeg, a generous pinch of salt and cook, stirring regularly, for 15 minutes. The sauce should be very thick, but still pourable. Whisk in a small quantity of milk if you think it needs thinning. Pass the mixture through a fine mesh sieve into a small bowl and set aside. 2. Melt the remaining 4 tablespoons of butter in a large sauté pan over medium heat. Add the green pepper, scallions and garlic, and cook gently for 5 minutes. Do not let them brown. Add the white wine, raise the heat to medium-high and allow it to reduce by half. Add the pimientos, American cheese, breadcrumbs, cayenne, a few grindings of black pepper, a pinch of salt and the reserved béchamel sauce, stirring to incorporate the mixture well. Reduce the heat to medium-low and let the sauce gently simmer for 10 minutes, stirring occasionally. When finished, it should be almost, but not quite, the consistency of mayonnaise. Taste the sauce for salt. Transfer the sauce to a small bowl and set aside. The sauce can be made up to 2 days ahead and stored in an airtight container in the refrigerator. 3. Divide 1½ pounds of the rock salt between four dinner plates, each large enough to hold six oysters. Distribute the salt evenly on each plate. This is simply to provide an attractive base on which the curved oyster shells can evenly rest. Test with one oyster, placing the more deeply curved shell side down. If you need more salt to support the shells, add it. Set the plates aside. Now divide the remaining salt between two roasting pans, each large enough to hold a dozen oysters in one layer. Distribute the salt as you did for the plates (if you run out of salt, you can also use dried beans or lightly crumpled tinfoil on the baking sheets). 4. Open the top, flat side of each oyster (the deeply curved shell should be on the bottom). Retain in each shell as much of the oyster liquor as possible. Discard the top shell, and free each oyster from its muscle. Transfer each oyster in its bottom shell to the salt-lined baking sheets. 5. Arrange the oven racks to accommodate both baking sheets, and preheat the oven to 400°F. 6. Place 2 teaspoons of the béchamel mixture on top of each oyster if they are medium-sized (a bit more if they are larger, a bit less if they are smaller). The mixture should almost, but not quite, cover the meat of the oyster. Place the baking sheets with the oysters in the oven and cook until there is a lively bubbling at the edges of the oysters, about 20 minutes. If your oven has hot spots, rotate the pans 180 degrees after 10 minutes. (And if your 2 roasting pans are on different levels, after 10 minutes carefully reverse the bottom and top baking pans to ensure even cooking.) When the oysters are done, allow them to cool for 2 minutes and, wearing rubber gloves or with the help of a large spoon, carefully transfer 6 oysters to each of the salt-lined dinner plates. Garnish each plate with a lemon wedge and serve immediately. For more stories like these, visit DavidRosengarten.com!